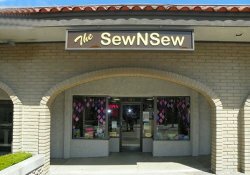 The SewNSew has been serving the Glendora, CA sewing community since 2010. Offering an extensive selection of fabrics, sewing notions, kits, books, patterns, and sewing machines to meet a wide variety of creative needs. We originally opened in a small 950 square foot space, but within three years we expanded to a 4500 square feet of space, housing nearly 10,000 bolts of fabric. We offer an extensive selection of fabrics from manufacturers such as Hoffman, South Seas, Northcott, Robert Kaufman, and Moda. As an authorized dealer for Baby Lock, Brother, and Janome; we carry a full line of machines for sewing, embroidery, and sergers; along with software and accessories. As the authorized dealer of Gammill for Southern California, we have a Gammill Quilting System on hand to help complete your quilt tops for you. At the SewNSew, we truly enjoy the beauty of fabric and thread, as well as the creative process that blends them into unique pieces of art. Our classes, taught by qualified teachers in a friendly, no-pressure atmosphere, are designed to help each student succeed at sewing, no matter their age or skill level.